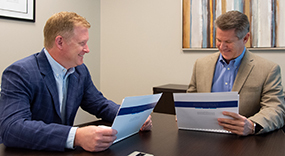 We serve as portfolio managers and most of our relationships are discretionary, meaning our clients have entrusted us to manage investments on their behalf. Our philosophy is to concentrate on sectors we find to have good momentum and strong earnings growth. We prefer to select equities that are both technically and fundamentally attractive, and we do our best to make tax-efficient transactions. When we consolidate a new client’s accounts, we often find that they own an over-abundance of securities, so we focus on what they need in the portfolio, which in our view is a focused, yet diversified allocation of equities in various weights, depending on their goals and risk tolerance. As part of our straightforward and transparent approach to portfolio management, we always want our clients to know not only what investments they own, but why. We also apply a similar approach to the fixed income portion of our clients’ balanced portfolios. Every investor’s situation is unique and you should consider your investment goals, risk tolerance and time horizon before making any investment. Investing involves risk and you may incur a profit or loss regardless of strategy selected.